devices configuration (e.g. of thresholds, etc.). The CEMS must be also interconnected with the Multi-agent platform to cooperate with the network. 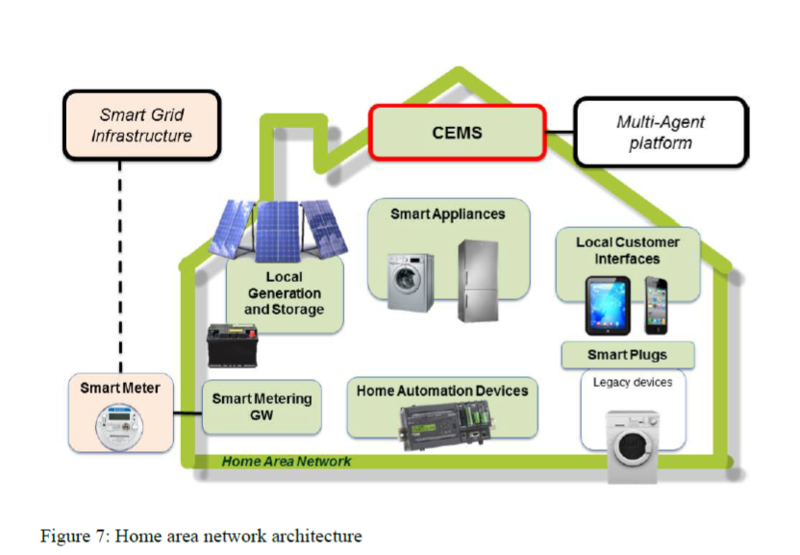 The diagram below outlines main connections between the CEMS the devices in the house and the Multi-agent platform. 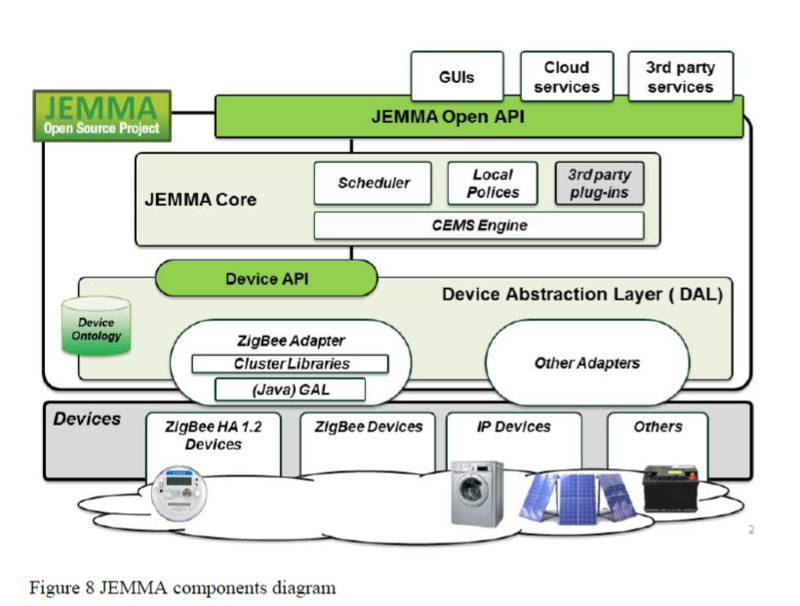 The Energy@Home alliance reference implementation of CEMS is an open source software called JEMMA (Java Energy ManageMent Application). It can be used to rapidly prototype and deploy smart energy applications at home. Jemma first released (v0.0.1) in October 2013, is based on a CEMS solution developed and validated in the Energy@home trials and its initial code have been developed by Telecom Italia. The diagram below outlines the main layers of the software. 1.2 cluster library included in the ZigBee network manager (also called ZigBee adapter) but it can be easily extended to add support for other protocols. The communication with the devices is also eased to third parties application thanks to the Device Abstraction Layer implementation (OSGi rfc0196 and rfc0210): it provides a standard way to interact with the devices even without knowing the protocol that the device is using. A device APIs are exposed in a standard way in terms of functionalities it provides. Each device’s functionality is registered as a service in the OSGi environment and each service is enriched with meta-information describing operation, properties and events the device can provide. The Device Abstraction Layer APIs can also be exploited by application running outside the gateway using a REST and WebSocket APIs. A technical requirements database: the developed components must satisfy these requirements and the fit criterion defined can be used to set-up and configure automated testing utilities. A set of development tasks defined by each task leader, linked with technical requirements priorizing them. A shared high-level view of the architecture: now the role of the components in the Home Area Network and Multi-Agent system platform have been clearly defined. Since this is the first deliverable containing those technical details, it is plausible that some of them will be subject to changes during the project lifecycle. Those changes will be present in the coming technical deliverables that will be provided in later project stages.